If you are anything like me, you struggle to keep your household in order and want to do it as naturally as possible. This includes making your own cleaning solutions, but with that comes blank jars and spray bottles and then scrambling for the recipe when it runs out or forgetting what is in the container to begin with. 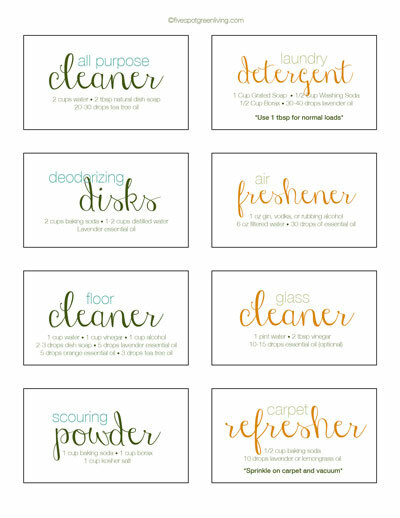 Here is your answer – Homemade Cleaning Recipe FREE printable labels with all the recipes from the post 10 Homemade Cleaning Products You Should Always Make at Home PLUS two bonus recipes and labels! Toxins are everywhere and when you use cleaners with toxins and chemicals you are not only exposing yourself to these horrible things but you are releasing them into the air where your family and pets can breathe them in. This post from the Facebook class Homemade Cleaning Recipes with Essential Oils also includes a TON of awesome recipes. Then you can print out the cleaning labels WITHOUT the recipes on them. Click on the link below the image for your download. Click here for the pdf – it will download automatically. Click here for the pdf WITHOUT the recipes – it will download automatically. Make sure you join the Five Spot Essential Oils Facebook group for daily tips, information and testimonials! Want to get started with essential oils? Click here to learn more.